HARLEM — A shooting at a Harlem club on 12th Avenue last weekend has local leaders concerned that the burgeoning party zone is getting out of control. Demarisa Steeley, 27, says her brother Edward Gaskin was shot in the arm while at Suite 135, at 701 W. 135th St., early Sunday, March 30, while celebrating his 22nd birthday. "He was just an innocent bystander," Steeley said. According to police, pushing and shoving between two groups of people turned into an argument before a single shot was fired on the first floor of the wall-to-wall packed club. It was the second incident in a little over a month. On Feb. 24, a 28-year-old man was beaten and robbed by two men outside Club 9A, located at 2331 12th Ave., after an earlier fight with a group of men inside the club. Police are looking for two suspects in the 4:15 a.m. incident. "We want to figure out what we can do to prevent this," said Community Board 9 Chairwoman the Rev. 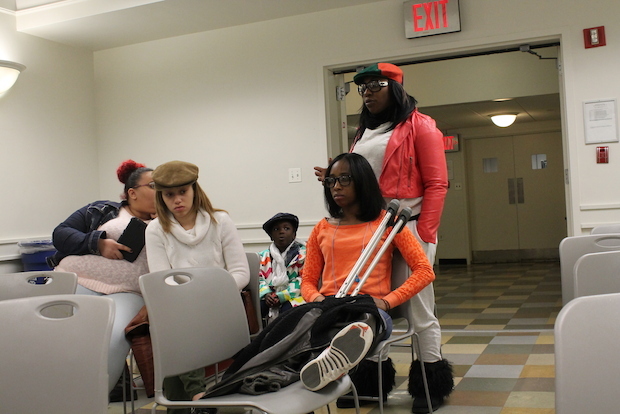 Georgiette Morgan-Thomas at a meeting with police, anti-violence activists and Suite 135's owner, security personnel and manager. Suite 135 manager Iman Hajismaiel told the group that a card scanner was broken and that there was no wand to check club goers for metal objects on the night of the shooting, but that the security was ample and included pat downs. Hajismaiel, who also manages La Marina and Phuket Lounge, believes the gun was smuggled into the club by a woman who concealed it underneath the lining of her bag. Suite 135 owner Joe Iacono said the shooter was looking for trouble. "Those people that started the fight were there to start a fight," said Iacono, adding that security video showed one person trying to apologize. Deputy Inspector Ruel Stephenson, the outgoing commanding officer of the 30th Precinct, said he was "disgusted" when he heard that an identification scanner and metal detecting wand were not used. "If your people don't set the tone at the door you are going to get anyone at your club," said Stephenson. "If people are getting shot, your business has to close. I have to prevent this from happening." The number of restaurants on 12th Avenue has been growing since 2009, said Nikoa Evans-Hendricks, president of business development group Harlem Park to Park. The area's infrastructure has not kept up with the growth in businesses, she said. "You don't have the car traffic, the police presence and the lighting. Once Fairway is closed there is a lot of opportunity for activity to happen under the cover of night," she said. "It's not an area that people are very comfortable going to at night." The area is also likely to undergo a significant change in the next several years as Columbia's Manhattanville expansion project continues and some of those infrastructure issues are addressed. "We are asking you to step up your game and let us know a plan is in place," the Rev. Vernon Williams said at the meeting. Hajismaiel said the club planned to cut its maximum capacity to 250 from 500, institute a policy restricting large purses and get new identification scanners and metal detecting wands. "We want your business to flourish but not on the lives and injuries of our young people," said Morgan-Thomas. If nothing changes, Stephenson warned that the business would be back in front of the community again, this time facing closure. "You can't prevent every incident," he said, "but you can prevent many of them."